Yesterday was the perfect morning to have breakfast on the deck. I'm not sure what it was about the morning, but, when I got up, it just felt like I should be outside. I opened the back door and stepped out. It was in the upper 70's. I dressed, made myself a bowl of cereal and sat on my deck enjoying the morning. This is the first day since power washing, planting, staining, planting, scrubbing, and painting that I have been able to just sit on the deck. When my cereal was finished, I brought out the scissors and deadheaded the flowers. I probably should prune the geraniums back a bit, particularly the pink one, but I think I'll wait until August. There was a lot that went into the compost bin, but the flowers look fresh and nice and they have a lot of buds on them so there will be more flowers this coming week. I decided the morning deserved cross-stitch. I brought my project to the deck, made myself some tea and commenced stitching. Eventually, the girls decided to come outside, too. The first forays onto the deck included going down the stairs to the yard which is a no-no. All I had to do was say the name and "no" and the offender dashed up the stairs and back into the house. They know. They just want to see if I'm paying attention. Pilchard came out first, after being shoed inside once for attempting to go down the stairs. It took a bit of persuasion but she hopped up into the other chair. 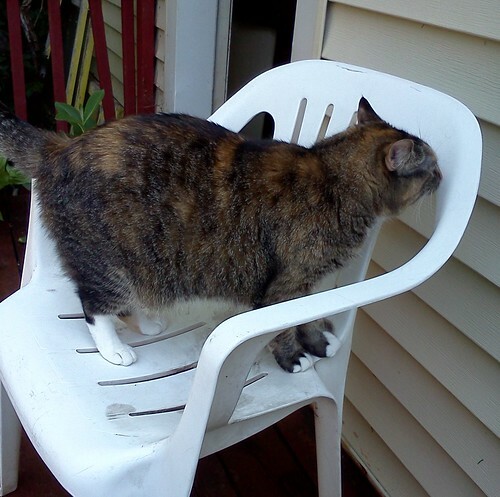 The whole chair was given a thorough sniffing and then, viola, she settled down. I love the position of the ears. It's the familiar, "Must you take a photo of EVERYTHING I do" look. She stayed with me for about 20 minutes and then the novelty wore off and she went back inside. That was Mija's cue to come out and take a look around. Sometimes I wonder what they smell. Their highly developed olfactory sense means almost everything has a scent. They just tune out what isn't important. I'm not sure a raccoon, for instance, hasn't been on the chair. 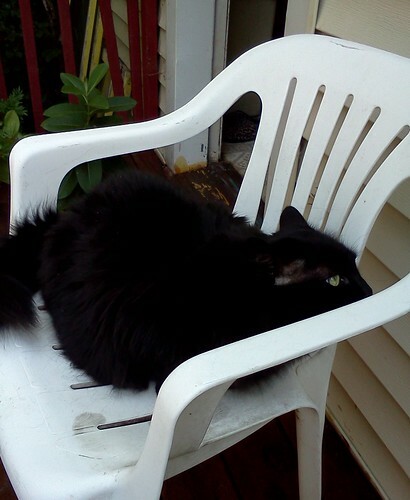 It's entirely possible that it came up on the deck and climbed up into the chair looking for food. Perhaps it's another cat, although I would have seen that face they make when they've smelled another cat. They both gave the chair a thorough sniffing, legs, arms, seat and back. Mija didn't lie down. 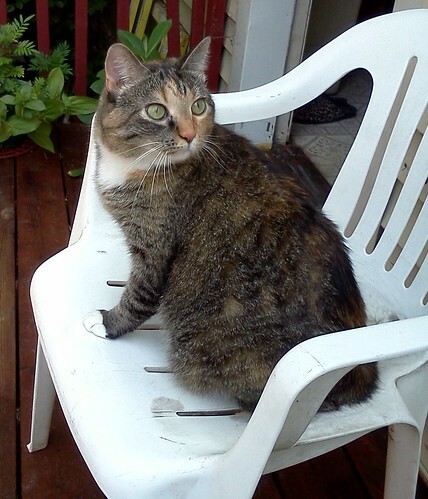 She sat there for about 10 minutes watching for birds and bugs and swatting at the flies that would land on the chair next to her. 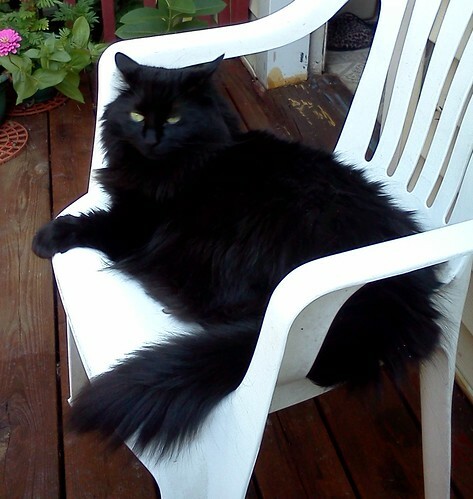 She actually wanted my lap a couple of times in the 2 1/2 hours we were outside. So this pleasant interlude causes me to wonder. If I bought another chair, would they each claim one and then settle down for a time? 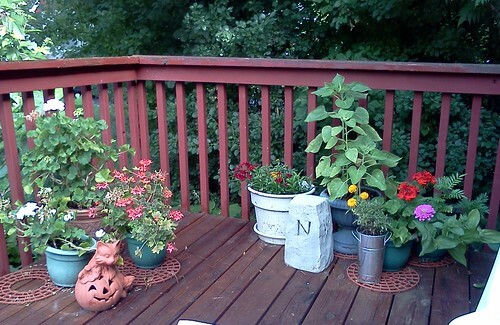 I think being outside in the fresh air is good for them and, as long as they stay on the deck, we can do this. Perhaps another Saturday morning experiment is in order. These chairs will be dirt cheap after Labor Day. Storage might be a problem, getting them in the storage container. We went inside when the sunshine had covered half of the deck. The day was heating up as well. It was delightful and a purr-fect way to start.